Traditional methods of energy production produce greenhouse gases. Global warming and other environmental concerns are important issue when comparing energy sources. Coal-based energy generation ‘Traditional’ fuel for electricity production accounts for around 40 per cent of electricity production nationwide. Impacts of coal-based power generation, significant water uses to remove impurities, emission of CO2, SO2, NOX, mercury compounds, leaves behind ash requires disposal. Natural gas-based energy generation is newer technology with significant reduction of GHG emissions at the plant level. Natural gas can be transported in pipeline with lower energy requirement than coal. However, the shortage of domestic natural gas has severely affected gas-based power generation in the country. As of December 2018, the country’s most of the gas-based power capacity was operating at a suboptimal plant load factor (PLF) of 22 to 25 per cent. Meanwhile, ready-to-commission gas-based plants totaling 4340 MW are unable to commence operations due to gas shortage. Against a total domestic natural gas requirement of 87 million standard cubic meters per day (mmscmd), an average of only approximately 29 million standard cubic meters per day of gas supplied to power plants in FY 2015-16. In this scenario, the government’s Scheme for Utilisation of stranded gas-based capacity, launched in March’ 2015 for a period of two years gave a shot in the arm to power plants. While the scheme has not been extended for further years, the government is reportedly working towards a more sustainable long-term solution to revive gas-based power plants. 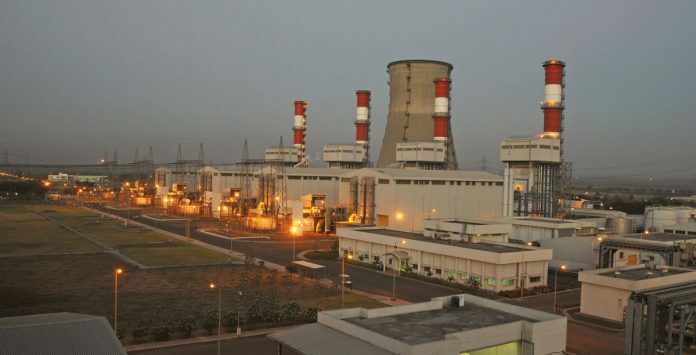 Gas-based power generation in the country received an impetus following the discovery of natural gas on the western coast by Oil and Natural Gas Corporation of India Limited in the 1970s and the subsequent commissioning of GAIL India’s Hazira-Vijaypur-Jagdishpur gas pipeline in 1987. In the following years, a large number of gas-based thermal power plants were set up along the pipeline, particularly in the northern and westerns parts of the country. Gas turbines basically provide a means of transferring energy from a pressurised fluid to mechanical energy in the form of a rotating shaft. The gas turbine compresses ambient air in a compressor and then channels the compressed air into a combustion chamber. The movement of the products of combustion through the turbine rotates the turbine shaft. Gas turbines are comprised of a compressor, combustor, and turbine. These components work together to produce power or thrust, depending on the application. To begin the cycle, the compressor rotates and draws in ambient air. As it is taken in by the compressor, the air is pressurised, in some cases to 40 times atmospheric pressure. The pressurised air then moves into the combustion chamber where a fuel mixture is ignited, heating the pressurised air and causing it to expand into the turbine. As the heated air expands through the turbine it pushes against the turbine blades which then rotate the turbine shaft. The rotational energy is used to spin a generator and create electricity. Because they are attached to the same shaft, the rotation of the turbine also rotates the compressor, keeping the system operating. Of the power generated by the turbine, 55 per cent-65 per cent is used to drive the compressor and the remainder is used to drive a generator. This ratio of total turbine power to the power that was used to operate the compressor is called the back-work ratio. While gas turbine power plants be operated with an open or closed cycle, open cycle plants are more common. The working fluid in an open cycle plant is atmospheric air, constantly drawn in to the compressor where it is typically compressed up to 18 times atmospheric pressure and then sent to a combustor. In the combustor, natural gas is burned to heat the air and expand it before it reaches the turbine. The exhaust further expands in the turbine, to approximately atmospheric pressure, and moves the turbine blades to create work. The exhaust is then released to the environment. In a closed cycle, the working fluid is cycled through the compressor and then heated by an external source before it enters the turbine. Instead of being released to the atmosphere, the exhaust is sent through a heat exchanger that extracts heat from the exhaust before it is returned to the compressor. In both cycles, the turbine shaft is connected to a generator that converts the rotational power into electrical power. With the discovery of natural gas in Reliance Industries Limited’s, Krishna Godavari in 2002 and the subsequent commissioning of the East West pipeline, a greater volume of gas was brought into the system in early 2009. With projections of a further increase in gas production, a significant addition of gas-based capacity was planned by the developers. However, contrary to projections, gas production declined considerably due to sand and water ingress, thereby, affecting gas supply to the power sector. Meanwhile, in March 2012, the Central Electricity Authority issued an advisory to developers, asking them to not plan gas-based power plants till 2015-16 on account of the decline in natural gas production. Gas supply to power plants increased from about 38 mmscmd in 2007-08 to about 59 mmscmd in 2010-11. However, it declined gradually thereafter, to reach about 28 mmscmd in 2015-16. As a result, the gas deficit in the power sector increased significantly. 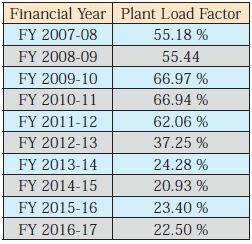 Taking note of the languishing gas-based power plants, the government launched the Scheme for Utilisation of Stranded Gas-based Generation Capacity in FY2015-16. Under the scheme, imported regasified liquefied natural gas (R-LNG) was supplied at a reduced price to stranded and partially stranded gas-based power plants, selected through a reverse bidding process. In the auction, the plants that sought the lowest per unit subsidy support for the sale of power to discom were selected, thereby, placing a premium on efficiency. The support from the Power System Development Fund (PSDF) was fixed at Rs 35 billion for FY 2015-16 and Rs 40 billion for FY 2016-17. The scheme also provided for a waiver on taxes and levies on the R-LNG being imported for power plants in order to reduce the price of gas. Under the scheme, the procedure for availing of the customs duty waiver on imported LNG for power plants was streamlined. Also, exemptions were provided on value added tax, central sales tax, octroi and entry tax on R-LNG. In addition, the scheme had a provision for the waiver of service tax on the regasification and transportation of the e-bid R-LNG. Further, the pipeline tariff charges were reduced by 50 per cent and the marketing margin by 75 per cent on e-bid R-LNG. Meanwhile, power developers were asked to forgo the return on equity, and transmission charges and losses were exempted for stranded gas-based power projects. So far, four rounds of LNG auctions have been held wherein gas-based units of NTPC, Gujarat State Electricity Supply Company, CLP India, Torrent Power, and GMR Energy etc have benefited. The simple cycle gas power plants in use currently are about 35 per cent efficient for two main reasons. First, the compressor uses a lot of energy to compress the air to the required pressure to run the air through the turbine. Because up to 2/3 of the turbine output is used to drive the compressor, only 1/3 of the rotational energy remains for conversion into electrical energy. Second, after the combustion gases pass through and exit the turbine they are still extremely hot (around 900–1200°F), so a significant amount of thermal energy is lost through the stack. In a simple cycle, this energy is wasted when the exhaust is released directly into the atmosphere. However, the energy can be recovered by using the exhaust to preheat the compressed air going into the combustor (which would reduce the fuel requirements), or by heating the air in the building or steam using a heat recovery steam generator. More than fifty per cent of the energy converted is used by the compressor. Only around 35 per cent of the energy input is available for electric power generation in the generator. The rest of the energy is lost as heat of the exhaust gases to the atmosphere. The power production of a gas turbine is greatly affected by weather conditions. Generally, the colder the inlet temperatures, the more power can be produced. It is for this reason that many gas turbine manufacturers install air cooling systems before the compressor. Hot weather, which prevents the coolers from lowering the air temperature sufficiently for the given application reduces the power output of the gas turbine. Because cold air is denser than hot air, the colder the air, the higher the mass flow rate of air is through the turbine, producing more power. When the weather is warmer, less steam is produced by a plant that is using its exhaust heat to produce steam to drive a steam turbine. At first glance, it might seem that less steam is produced because of the lower exhaust temperatures, but it is actually because there is less hot exhaust gas flowing out the exhaust because the warmer inlet temperatures of the gases have lower density. After the air is compressed it travels into the combustion chamber; keeping the air as warm as possible reduces the energy needed for the combustion process. Preheating the air can be achieved without additional energy input by passing it through a heat exchanger, called a regenerator. A regenerator enables the considerable amounts of heat still contained in the exhaust exiting the gas turbine to be transferred from the exhaust to the air that is about to enter the combustor. This process increases the efficiency of the combustor, which then produces hotter exiting air that in turn generates more power from the gas turbine. Gas turbines have in the recent times become one of the most efficient and reliable energy conversion devices. Used in Combined Cycle Power plants they give the highest efficiency for converting fossil energy to electric power. Used in simple cycle mode they have the shortest gestation time. There are several advantages to using a gas power plant to generate electrical power as compared to other systems. Gas turbine power plants can be started up and run at full capacity in only 10 to 20 minutes, making them well suited as backup plants for utility companies that require additional electricity immediately. Because they are smaller than coal or nuclear plants, gas power plants can be built faster and at a lower cost. Gas turbine systems also require much less water than steam power plants, and they are easily converted into combined cycle power plants, which are much more efficient. Natural gas has a high energy density (for a fossil fuel) and flexible applications, which make it a popular fuel. People advocating for natural gas often point to it as the cleanest burning fossil fuels. Natural gas power plants are cheap and quick to build. They also have very high thermodynamic efficiencies compared to other power plants. Burning of natural gas produces fewer pollutants like NOx, SOx and particulate matter than coal and oil. Gas turbine power plants have disadvantages as well. The power needed to drive the compressor reduces the net outputs, consuming more fuel to do the same amount of work. The operating temperature in gas turbines is higher than in other power plant systems and can shorten the lifespan of some of the system components. Furthermore, because the thermal energy is wasted when the exhaust is released, the efficiency levels of gas turbine plants are lower than those of other types of power plants. Natural gas plants have significantly higher emissions than a nuclear power plant. Despite the improved air quality, natural gas plants significantly contribute to climate change, and that contribution is growing natural gas power plants produce considerable carbon dioxide, although less than coal plants do. On the other hand, the process of getting natural gas from where it’s mined to the power plants leads to considerable release of methane (natural gas that leaks into the atmosphere). As long as natural gas plants are used to produce electricity their emissions will continue to warm the planet in dangerous ways. Even as a cleaner fossil fuel, natural gas is still made up of hydrocarbons and burning it releases CO2 and other pollutants (NOx being a problem specifically). Natural gas use is often an improvement over coal, however, its combustion still contributes to air pollution and climate change. As per the National Electricity Plan released by CEA in December’ 2016, except the ready for commissioning / under construction gas based power plants totaling 4340 MW, no other plants are expected to be commissioned during the 13th Plan period FY 2017 to FY 2022, owing to the shortage of gas. Given the benefits of gas-based power plants in efficiently balancing the grid and reducing emissions, the government needs to make strong efforts to revive domestic gas production and/or look at importing natural gas. Lack of concern initiatives in this regard may result in existing and under-construction gas based plants turning into non-performing assets. Thus, there is a need to incentivize exploration and production of domestic hydrocarbon resources. At present, the natural gas prices in the country are inadequate to cover the cost of production. Beside, given the natural gas glut in the international market and the decline in prices, long-term gas import contracts can be looked at as a viable option. Gas turbines are found to be more efficient than coal power plants at full load and at minimum complaint load. However, their efficiency range is broader and their minimum power load is higher than those of coal power plants. Gas turbines are not only more efficient, but also faster than coal power plants. Start-up times in gas turbines range between 4–45 min in hot starts and 4–250 min in cold starts, which is quite lower than coal power plants. Similarly, full cycle times for gas turbines range between 45 and 280 min, while for coal power plants range between 350 and 800 min. Ramping rates are also generally higher in gas turbines than in coal power plants.